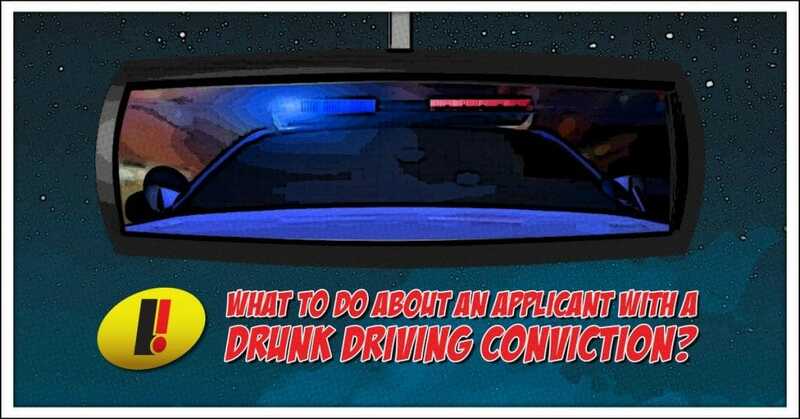 What to do about an applicant with a drunk driving conviction? I have a qualified applicant who disclosed that he pleaded guilty to driving while intoxicated two years ago. We have a zero-tolerance drug and alcohol policy. Can I eliminate him from consideration due to our policy? You can pretty much do whatever you wish so long as your policy doesn’t disproportionately impact a protected class without a business justification (i.e., disparate impact until Title VII). Being a former criminal offender isn’t a protected class in Texas or under federal law (yet). Is that his only offense? Was anyone injured or was property damaged? Was this DWI on the job? Is the position for which he applied a safety-sensitive role (operating a motor vehicle, forklift, or other dangerous equipment)? What employment risks does this DWI suggest for the role for which he is being considered? Does anything else in the rest of his employment history or other background suggest that he has poor judgment, poor safety awareness, or is generally uncompliant? Does he accept responsibility for his actions or does he make excuses? While I’m not crazy about zero-tolerance policies, your drug and alcohol policy should definitely be enforced once someone is an employee. And if an individual had multiple recent DWIs or criminal cases in recent years, I’d likely consider him a higher risk for unsafe behavior, poor judgment, lack of self-management, and compliance resistance. However, the court system is full of otherwise responsible adults who got caught after making the seriously bad decision to drink and drive. And let’s face it, the streets are full of people (likely including some of your best performing employees) who haven’t been caught yet–but could be this weekend. My advice (and I’m not a lawyer!) is to always review the entire applicant–not just the criminal history. When you look at the applicant’s entire background (employment history, experience, education and skills, along with criminal history), what does it suggest about his future performance if you were to hire him? If you decide to move forward with him, I’d emphasize the company’s drug and alcohol policy and explain that you expect him to take care of business both at work and on his own time. There is no one-size-fits-all answer for employers considering applicants’ criminal histories. However, there are policies and procedures that will help ensure that you are consistently fair and legally compliant while maintaining a safe and productive workforce. In the second webinar in our fall webinar series, Creating a Criminal History Evaluation Tool for Employment Purposes, we’ll walk through the tools and policy considerations I use with our consulting clients to connect applicants’ past criminal behavior to the risks associated with the job–before you’ve ever met the applicant. You can still register for our free webinar series and even watch the previous webinar for HRCI and SHRM recertification credit. If you find yourself struggling with issues like this, register today!